This month I’ve been feeling pretty run down. I’m not sure whether it’s the ever-changing weather or if it’s because I’ve had to juggle a crazy work load at work, either way I needed to find something that would help me perk up a bit more during the day. Since energy drinks are out the question, I was super excited to try out a more natural means – Purple Matcha tea by Williamson tea. Williamson tea state that one of the main benefits of drinking matcha tea is the “extended release of caffeine and prolonged energy”. Unlike coffee and energy drinks which give you a quick burst of energy, followed by a crash, matcha actually results in sustained focus and alertness. Like most people I had of course heard of green tea but never purple matcha tea. I was definitely intrigued! The packaging is absolutely beautiful, I loved it so much that I didn’t even want to open it for fear that I might ruin it. 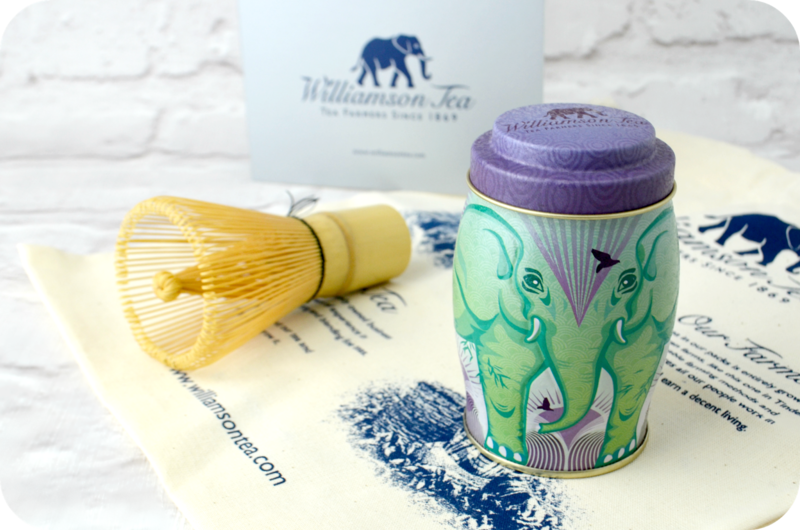 The tea comes in an absolutely stunning elephant tin with a purple lid and along with it, I received a little Williamson tea canvas pouch and a bamboo whisk. The whisk really threw me, as I wasn’t quite sure what to do. There were no proper instructions and I’d never used a whisk for tea nor had I heard of purple tea. So many questions! I decided to start by opening up the tin. For some reason I kept envisioning a Vimto type drink and something really artificial looking. To my surprise the tea isn’t actually purple. It’s more of a beige/brown powder that’s made up of a blend of purple tea leaves and green matcha tea. It smells really rich and nicer than green tea. After all my stressing, it turns out that the tea very easy to make. I mixed 3 grams (which is about a teaspoon) of purple matcha to boiling water straight into a bowl. Then using the whisk provided I whisked until small uniform bubbles formed and voila, it was ready to pour into a mug and enjoy. Once brewed it actually looks more of a greeny/brown colour, still no purple! The smell isn’t offensive at all and in fact when brewed it still smelt very rich. It is said to have a nuttier taste than green tea and after a few cups I can really appreciate it. It’s a lot less bitter than green tea so I was really happy. All in all, I really loved drinking it in the morning at work. It curbed my hunger surprisingly which I wasn’t expecting and I did feel a little bit more ‘awake’ until late afternoon. I have really grown to like herbal teas but I do have to be in the mood for them. Whilst doing a bit of research on the benefits of matcha tea I found out that you can actually mix it into smoothies and shakes to give you the same energy boost. Now this I was excited about! For the past week I’ve been experimenting with smoothies and adding a spoon full of purple matcha. I like to think it’s another bit of goodness I’m putting into my body which helps my productivity levels. 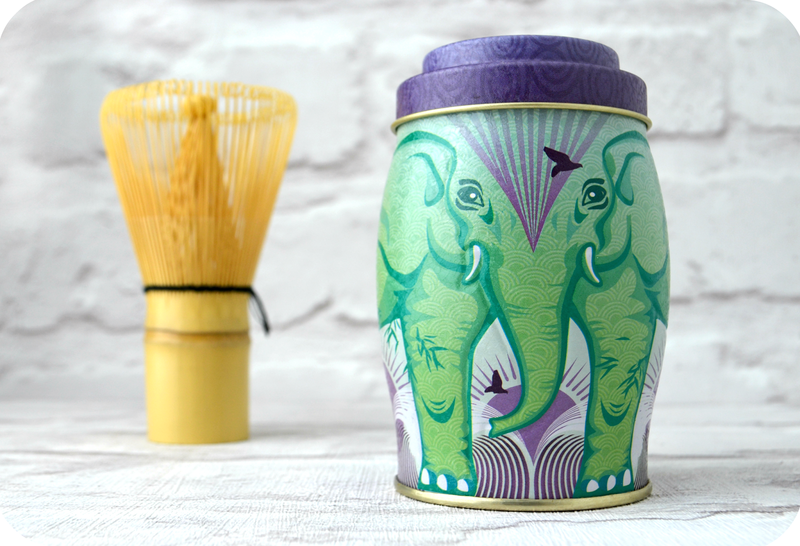 You can purchase Williamson teas in Harvey Nichols or on their website here.